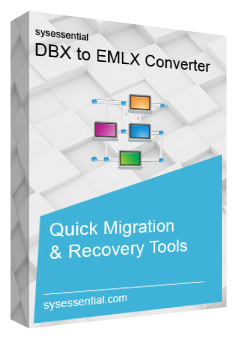 Sysessential for DBX to EMLX Converter is a useful solution that able to carry out email migration from DBX files into EMLX file format. The application is perfect when it is to migrate unlimited DBX files into EMLX file format. Perform swift data move from DBX files into EMLX. Unlimited Features of DBX to EMLX Converter Check Outnow! If you are under impression that software is costly then there is nothing like that as tool is pocket-friendly and does not pinch the pocket at all. The application is time saving utility because it performs batch data export from one email client into another. The batch saving data facility saves lots of time. Sysessential software provides you facility to make quick data transfer including images, documents, and email attachments into EMLX. It is always assured that data is not altered at all. You can trust the features and functions of the tool as it does not affect data integrity at all. Data loss like scenarios never come up while operating the application for exporting emails from DBX to EMLX file format. The freeware demo run of Sysessential for DBX to EMLX Converter is worth to buy software. You can test the features and working process in free of cost trial run. This will help you to test the tool’s way to migrate emails from DBX. Demo will show conversion of first 10 emails only. Licensed edition supports converting bulk DBX files into EMLX file format because there is no email restriction in full edition. Is software able to make instant migration when data is in bulk? Yes, this application is powerful and will be able to migrate bulk export of DBX files into EMLX without affecting data integrity. There is proviso for making instant data migration and that too without causing any sort of data loss. Will software able to keep folder structure same even after export of emails? Yes, this application is supportive of keeping folder structure as it is. The tool never ever cause any sort of data loss like scenarios. Feel safe with the tool always. Will this application able to make selected data migration? Yes, the application supports converting only few emails that user has selected into EMLX file format rather than moving all emails. Recently I found the need for converting emails from DBX files into EMLX file format in order to open into several EMLX file supporting email clients. For rectifying such a scenario quickly, I decided for seeking professional help and thus chose Sysessential for DBX to EMLX Converter. The tool is ultimately beneficial to operate because of simplicity involved with it all the time. Few days backbit got into urgent need of converting DBX files into EMLX file format. I liked the simple functioning of Sysessential for DBX to EMLX Converter in free demo. I tested other tools as well but they were complex to understand. After buying the tool in full operable mode, I converted all the emails swiftly from DBX files into EMLX. I am relaxed because no data loss like cases appeared at all.